In the last decade, the development of single-use technologies in biopharmaceutical manufacturing has brought a wide variety of bioreactor systems from 10 mL up to 2,000 L to the market. The use of single-use bags in an orbital incubator shaker represents a novel and very simple approach for the scale-up of processes to a working volume of 10 L. This has been realized by INFORS HT through the introduction of the ShakerBag Option for Multitron Cell shaker incubators. 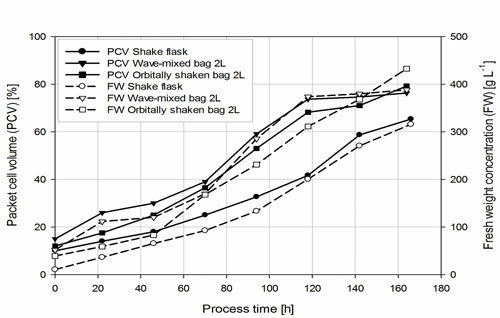 A detailed study provided an initial engineering characterization of orbitally shaken single-use bags with a square footprint using traditional methods. The results were compared with geometrically dissimilar tubular bioreactors and conical cultivation vessels (e.g., tubes, shake flasks). Additionally, computational fluid dynamics (CFD) was used to gain a deeper insight and increase knowledge of fluid flow behavior. The use of CFD offers the advantage of being able to obtain local and time dependent results, allowing analysis of minimal and maximal values for process crucial parameters, which cannot be evaluated using traditional methods. The results of the engineering characterization were validated by cultivating plant suspension cultures (Nicotiana tabacum BY-2 and Vitis vinifera) and insect Sf9 cell cultures. These cell cultures can be used for the production of bioactive substances such as secondary metabolites (plant cells), vaccines (insect cells) and recombinant proteins (plant and animal cells) having importance in pharmacy and cosmetics. Thus, the option to easily scale up processes using orbitally shaken bags shows great promise and creates potential for rapid, cost-saving increases in cultivation volumes using existing shaking incubators. Mixing time using the decolorization method (iodide thiosulfate with starch solution). Oxygen mass transfer rate kLa using the dynamic gassing out method and the sulfite method in coalescence-inhibited medium at 25°C. Using design of experiments (DoE and OpenFOAM for CFD. N. tabacum Bright Yellow 2 cells grown in Murashige & Skoog medium with minimal organics plus (MSMO+) at 25°C, expresses a monoclonal antibody; Fraunhofer IME in Aachen. V. vinifera cells grown in Murashige & Skoog (MS) medium at 25°C, presents a model system for aroma analytics; ZHAW in cooperation with ETH Zürich. Insect cells (Sf9) were cultivated at 27°C in Sf-900™ III SFM (Invitrogen). Inoculation density of 15% packed cell volume (PCV) from seed produced in shake flasks. Operating parameters: 50 mm throw at 120 rpm for the 500 mL shake flasks, 40–67 rpm for the orbital shaken bags, and 8–10° rocking angle and 30–42 rpm for the wave-mixed bags. Orbitally shaken single-use and wave-mixed bags were aerated with 0.5 vvm. In-process-control (IPC): viability by microscopy, PCV by centrifuging and fresh weight by filtration (filtrate for pH and conductivity measurement, sugar, nitrate, and ammonia analyzed by HPLC). Inoculation density for all cultivations was approximately 1.0 x 106 cells mL–1. All three cultivations were performed with a throw of 50 mm and a temperature of 27°C, using 175–180 rpm for a tubular bioreactor, 50–80 rpm for the 500 mL shake flask, and 30–44 rpm for the orbitally shaken bag, aerated with 0.2 vvm. After a two-day growth phase, virus infection (Sil9.1.1_GFP_SEAP_His MP 9.8 V2 engineered at ZHAW) with a multiplicity of infection (MOI) of 0.01 and a time of infection (TOI) of 2 x 106 cells mL–1. Virus generation 2 was used for the SEAP (segregated alkaline phosphatase) production. Cell density and viability were determined using Cedex HiRes (Roche Diagnostics). Metabolites analyzed using a Bioprofile 100 (Nova Biomedical). Analysis of SEAP protein by a spectro-photometer (Multiskan Spectrum 8404, Thermo). The mixing time for the orbitally shaken bags is shown in the Table. It can be seen that mixing time in every bag is lower at higher shaking frequencies, and thus the mass transfer rate can be expected to increase. Nevertheless, at lower shaking frequencies, an adequate mixing time can also be achieved. The most important finding is the range of operating parameters at which demixing occurs. It is assumed that this can be described by the out-of-phase phenomenon, which has only been reported for conical shake flasks by now. Based on the results of the mixing time study, the Table shows the range of shaking frequencies for a given volume and shaking that are suitable for cell cultures. 40 h-1 orbital shaker 20 L bag (10 L, 60 rpm, 50 mm). Figure 1 shows that in all three bioreactors, the maximum PCV and fresh weight concentration are in the range of previously reported concentrations for tobacco and grape suspension cells. Morphological control and viability staining reveal no difference between the three bioreactors. The data (not shown ) for fresh weight and conductivity also confirm a very good correlation. Figure 1. Packet cell volume (PCV) and fresh weight (FW) concentration of N. tabacum cells in shake flask, wave-mixed bag (2 L), and orbitally shaken bag (2 L). Figure 2 shows cultivation results for Sf9 cells with a SEAP expression system, based on the baculovirus expression vector system in in all three cultivation containers. Previously determined specific oxygen uptake rates of insect cells (2 x 10–13 mol cell–1h–1) reveal that these operating parameters are adequate for cell densities of up to 1.25 x 107 cells mL–1. The preliminary growth phase is almost identical in the different bioreactors and achieved the desired cell density. After infection, the viability decreases faster in the tubular bioreactor, followed by the 500 mL shake flask. The viability of the cells in the shaken bag remains high over a long period. The viable cell count exhibits the same characteristics. This finding is reflected by a SEAP concentration on day 5 p.i., which is highest in the bag (37.7 U mL–1), followed by the shake flask (36.5 U mL–1) and the tubular bioreactor (30.9 U mL–1). The results from growth and production of both cell types show a good correlation between common shaken containers. The orbitally shaken bag is highly suitable for plant and animal cell cultivation at the bench scale, providing a familiar, cost-effective, and flexible method for production of large volumes of culture in the laboratory. Figure 2. 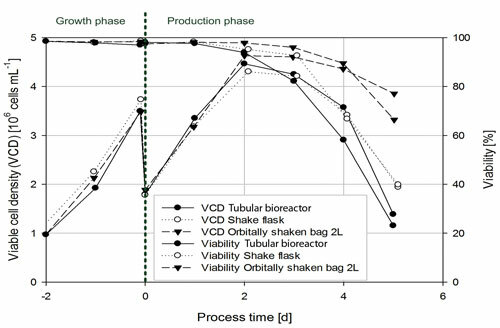 Viable cell density (VCD) and viability of Sf9 cells in tubular bioreactor, shake flask, and orbitally shaken bag (2 L). Johanna Olownia (j.olownia@infors-ht.com) is product manager, cell culture at INFORS HT. Sören Werner (soeren.werner@zhaw.ch) and Dieter Eibl, at the University of Applied Sciences in the Institute of Biotechnology, Zürich, Switzerland, contributed.